In the city of Levis, Quebec, one section of a storm water drainage system comprised of corrugated metal pipe was identified as high concern. After a visual and acoustic assessment, two anomalies were chosen for BCT imaging. Backscatter Computed Tomography (BCT) has been applied to this unmet inspection challenge and is capable of providing diagnostic imaging to enhance the understanding of structural soil conditions around CMP assets. BCT allows a full structural condition assessment and is the only non-destructive method for imaging in-situ soil voids and undermining around CMP. As part of a comprehensive assessment protocol, this technology can be used in asset management programs, rehabilitation planning, safe replacement or deferral, post construction QA/QC, or in emergency situations. Collapse, replacement and maintenance planning have been identified as areas of concern in transportation, stormwater and flood control systems comprised of CMP. Time and environmental conditions wear away the supporting soil around the pipe. As these pipes are considered flexible conduits, the structural integrity is dependent on the supporting soil. An improperly supported pipe will experience mechanical stress and deformation which can eventually result in a catastrophic failure. As a result soil voids and undermining must be considered when evaluating the structural condition of the asset. Conventional pipe inspection methods are subjective and speculative, often lacking descriptive evidence of the condition of the pipe’s supporting soil. Until now, testing methods have been limited to visual appraisals, acoustic assessment and destructive testing. Visual appraisal, either in person or by remotely-controlled CCTV, is effective in identifying corrosion, joint failure, misalignment, deformation and ovality. However, this method fails to provide information regarding the degree of soil loss in the supporting soil envelope of the CMP. Acoustic testing is done by striking the pipe and identifying anomalous regions by sound. This method is subject to frequent false positives due to soil compaction variability and soil composition. Destructive testing is conclusive; however, it exacerbates potential soil void and corrosion problems by introducing avenues for soil ingress to the pipe. The introduction of Backscatter Computed Tomography, in the form of insight to CMP evaluation, is the final critical step in full and conclusive structural condition assessment. The system is suited to evaluate corrugated metal, plastic and composite pipe (lined or coated) in nominal diameters 900 mm and larger. To achieve this, a three-part assessment protocol is employed which can be broken into two tiers. Tier 1 includes a rigorous visual assessment and an acoustic testing process which screens 100 percent of the pipe for anomalies. Tier 2 consists of BCT imaging to conclusively identify, visualize and quantify all anomalies and identify soil voids around CMP structures identified during Tier 1 assessment. BCT is a form of industrial diagnostic imaging that provides information similar to that of a medical CT scan. It creates a relative map of density, which allows the system to distinguish between materials of different density and map their location. The resulting image allows the verification of soil presence or void behind a CMP wall, the quantification of any presented voids and the visualization of the geometric shape of the void. Utilizing results from the visual and acoustic assessment, areas for diagnostic BCT imaging are selected. The BCT scanner is positioned against the pipe wall and a region of up to 30 cm per position is imaged and assessed. BCT images provide a cross-sectional view behind the pipe wall. The head of the application unit during the centrifugally cast concrete pipe application. The City of Levis owns and operates a significant storm water drainage system that serves the city and surrounding areas. Some of this system is comprised of corrugated metal pipe. One section in particular was of high concern and was requested for immediate condition assessment to guide rehabilitation efforts. A visual and acoustic assessment was carried out, four anomalies were identified and two anomalies were chosen for BCT imaging. Locations were measured from manhole access (STA0+000) to the outlet (STA0+180). Seams throughout the storm drain were in poor condition, several with visible voids, above and below the pipe, allowing water to run underneath causing flow-related soil failure. The ovality of the pipe diameter is greater than 10 percent, the majority of issues being underneath Autoroute #73. Several rock impingements were noted, the largest located directly beside the entrance of the manhole located on route #73 (STA0+137) from the access manhole on Avenue de la Rotonde. The bitumen coating throughout the pipe had become dried out and brittle, chipping during hammer testing. The outlet of the storm drain (STA0+156) to (STA0+180) was in very poor condition; two acoustic anomalies were found. Evidence of buckling and significant scour was noted. The outlet of the pipe was damaged with several large indentations. BCT images at two locations were taken to verify soil structure. The largest confirmed void identified a void 14 centimetres in depth spanning more than three corrugations. The location of this void was concerning as it was located directly under Autoroute #73. The other images showed that there was adequate backfill supporting the pipe. Image B-2142 displayed discontinuous CMP wall and small soil void pocket behind a seam separation. Image C-2143 indicated a void in a single corrugation; it did not span corrugations. A thorough review of the structural condition assessment of the storm water drainage section under Rotonde Avenue and Autoroute 73 in Levis was used to formulate a comprehensive rehabilitation plan. The main body of the pipe was referred to in Stages 1, 2 and 3 of this project (STA 0+000 to STA o+156). The downward sloping outfall section was considered Stage 4 of this project (outfall). Two primary rehabilitation techniques have been identified as viable options for the rehabilitation of this pipe segment (STA 0+000 to STA o+156): Spray in Place Pipe (SIPP) polymer solution and Centrifugally Cast Concrete Pipe (CCCP) solution. To begin rehabilitation, cleaning, sealing and void filling must be accomplished to achieve optimal results. This pipe is completely covered in a bituminous anti-corrosion coating. As noted in the condition assessment report, this coating is completely worn away in the invert of the pipe and deteriorated past the point of functionality elsewhere on the pipe wall. Removal is highly recommended and is a requirement for use of CCCP and SIPP. A structural deficiency at STA 0+138 was identified. The nature and extent of this deficiency will require localized repair beyond the scope of either CCCP or SIPP. This localized repair must be addressed as a first action in Stage 2 prior to Stage 3 work. The deflection of the pipe wall at STA 0+138 represents a significant risk of pipe failure under Autoroute 73. It is recommended that galvanized steel tunnel plate be used to reinforce and stabilize the pipe in this specific location. This technique offers the advantage of being assembled in the host pipe, as well as providing a localized repair strategy providing excellent long-term stability. This technique will cause some flow restriction, but is an excellent tradeoff in risk mitigation and cost. The main barrel of the pipe STA 0+000 to 0+156, is now considered prepared for lining. The two options are CCCP and SIPP. Both options are detailed in the full report with material, application and curing specifications. This section will discuss the recommended action for the down-sloping outfall section of the pipe from STA 0+158 to STA 0+180. This segment of the pipeline was in a state of advanced deterioration. There are obvious signs of undermining throughout the entire invert, wall buckling failure in the invert, and severe damage to the pipe end. The long-term viability of this segment is questionable, therefore replacement of this section is recommended. Due to the physical location on the roadway embankment and the difficulty of excavation at this site, this may not be a cost-effective project at this time. Possible risk mitigation strategies can be undertaken to prolong the effective service of this segment of the pipeline. The invert of the outfall must be stabilized and soil stabilization will be of key importance to this effort. If the asset owner deems, maximum service life extension is a priority for this segment; a spray applied protective coating is highly recommended. Joint caption separation witnessed on a section of corrugated metal pipe in Levis, Quebec. CMP structures are subject to a variety of failure modes and each site presents unique conditions that impact the structural condition of the entire structure. 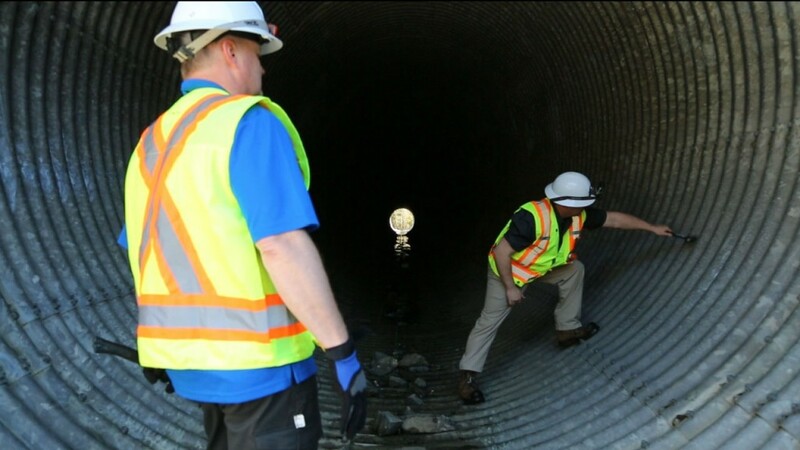 By utilizing the best in condition assessment and combining the latest in trenchless techniques, the most responsible, cost effective and safe solution can be applied to aging infrastructure. During projects across North America, other soil voids with unique geometry have been identified that offer previously unavailable information to guide decision making. The unique nature of each asset, and the importance of identifying what sort of failure mode is present when planning and designing an effective rehabilitation, is now able to be more completely understood. By addressing this pipe trenchlessly as opposed to digging it up, cost saving of over 50 percent was proven. By applying this condition assessment to large sections of inventory, Tier 1 screening can exclude structurally sound pipes from Tier 2 screening. Structurally sound pipes can then be monitored and deterioration trended over time. Assets that require further investigation into their structural condition undergo Tier 2 assessment for full asset diagnosis. This information not only optimizes individual rehabilitation projects, it optimizes the long-term asset management and rehabilitation planning of CMP assets. The information provided allows for the maintenance of assets to be either safely deferred or planned for future remediation activities.